This traditional dish is almost forgotten. I have not seen anybody preparing it these days. When I was a kid, aayi prepared them occasionally. It requires a lot of patience and time to prepare this dish. If you master it once, this might become easier. But the taste is so unique and tempting that you would feel like making again and again. Back home, we enjoy it the most when eaten with a hot cup of tea on a rainy day in July. This is a special variety of "Chattambade". Few days back, I had posted about the "Chattambade" that is made of chana dal. But the difference is, the chana dal chattambade, need to be eaten immediately, and they are a bit soft. Gharyo are very crispy and can be stored for around 15 days (like any other munchies). It was an absolute favorite of my Dad and when my parents saw the Diwali spread here, he started asking my Aayi to prepare it :D.
PS: While grinding the daal for this dish, water SHOULD NOT be added. Though I knew this, I added little bit of water because my blender was not grinding it properly. But then, when I tried making these, they just got broken and I had to make them again. So be careful, NO water while grinding. 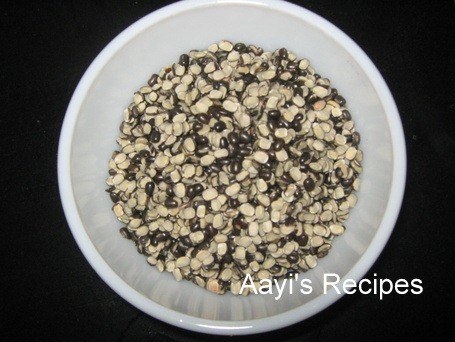 Soak the urad dal(with skin) in water for around 1-2 hours. Grind it coarsely without adding water. Add coconut, chopped ginger, chopped chilies, curry leaves pieces and salt. Apply some oil to a plastic sheet(I used aluminum foil). Take a small ball of the mixture, and spread with hand (spread as thin as possible, take care they should be able to lift easily). Heat oil. Lift the vadas and deep fry on a very low flame. (If flame is kept on high or the vadas become thick, they remain soft from inside). Take out on a kitchen towel. Cool them to room temperature and store in air tight container. these)and dipped it into the oil to coat it. This spatula has a curved edge and needs to be kept oiled like cast iron…don’t know if you’ve seen these, but they hold a film of oil on itself very well…I used the underside to press the raw vada as flat as possible…and it did so very neatly…then when, the oil was hot, i used this same spatula to lift it and turn into the hot oil….it became an easy system,just had to dip the spatula into the oil each time i made a new group to fry". Hi Shilpa, Happy Diwali to you and yours. You are so motivating and done such a wonderful spread. Thanks for all the great recipes and sharing Konkani traditions. Wow Shilpa……I have eaten this many years ago in native place when cooks were hired at my grandmoms place for various occations. I guess is getting extint. Thanks for keeping our traditions alive. I have to try this. One question is the urad dal the split one with skin or the whole urad with skin. Shilpa! You are the best! Love your traditional recipes. Hope you have a nice diwali! Thanks Bhanap. A very happy Diwali to you too. Aruna, urad daal (split one) should be used for this dish. Not the whole urad. Thanks Deepa. Wish you also a happy diwali. Krithika, let me know if you try this. Usha, I will be waiting for your post. You have a wonderful blog Alison. All the best. Thanks Pelicano. Let me know if you like them. I don’t have any explanation about the name “Gharyo”, don’t know the meaning of that name. I am sorry :(. Shilpa, looks like my earlier comment is lost. I’d like to know if this is a hard or crisp as urad generally makes stuff hard? These are very crisp Anjali. The skin gives the crispiness. I recently had these at a friend’s place who had brought them from India. I think I practically finished a whole packet !!! I have been a regular visitor of ur blog literally everyday, but never left a comment so far. this is pretty much similar to our south indian bonda, the difference being we use split urad without skin and add some whole pepper, coconut pieces, g. chillies, and curry leaves. it is made the same way as the gharyo. this and kokum shrimp recipes of yours are great. will try to make more recipes of yours. 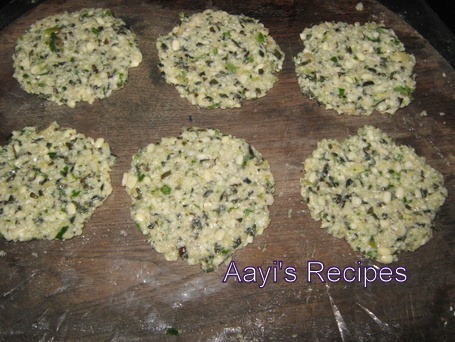 u have a really nice blog with very good homemade foodstuff which is great. Trina, Can you please describe this spice a bit? I have never heard this name. Trina, please send the mail to aayisrecipes AT gmail DOT com. You are really awesome! I really appreciate your enthusiasm and passion to pursue your hobby! Thanks a lot for your lovely recipies. 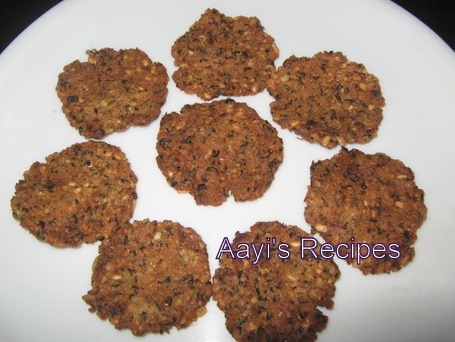 I just cannot thank you enough for this lovely recipe, Shilpa! (and I mean it seriously at 1/2 hr to the stroke of mid-night). Well the story goes like this… last night i soaked a cup of whole urad dal with skin hoping to use it up for idli batter. But it was painfully difficult to rub off the skins so I was desperately looking for some way to use this soaked urad dal. Then to my great relief, i found your recipe. I didn’t get the shape well on the first few but i must admit making vadas on foil is the toughest job;) plastic sheet is better:) and ofcourse since the urad dal had soaked close to being sprouted, it was a bit sticky and difficult to handle even grinding without water. but believe me this is the tastiest, healthiest snack i have ever made. I ground the green chillies etc., along with the dal so my 2 yr old can eat without any difficulty. i came across your comment that this is to be made with split urad dal,a bit too late, but this came well even with the whole ones. Thanks again! Shilpa: Thanks Latha. Usually I write Urad for whole urad and urad daal for split urad. I didn’t know it was confusing. tumgele gi thukdi recepie assa vei? gavun use karta ki maida? Shilpa: Thanks Pratima. We call tukdi as gooD shankarpaLi. Its made of maida. Will post it sometime. Where can I find the recipe for thukdi (sweet and spicy) on this website? Really nice recipies. I will surely try them,could you put some recipes on how to make macroni n chesse or different kinds of pasta. i love italian food. 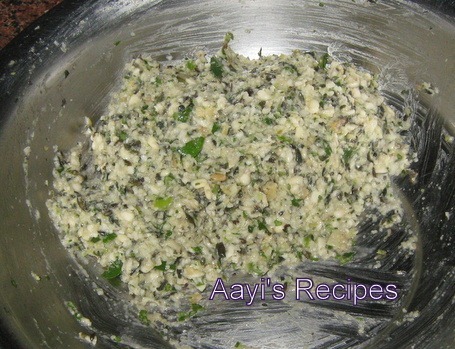 I make a lot of authentic konkani dishes..but have not heard of this one.. THanks for the recipe.WIll try. 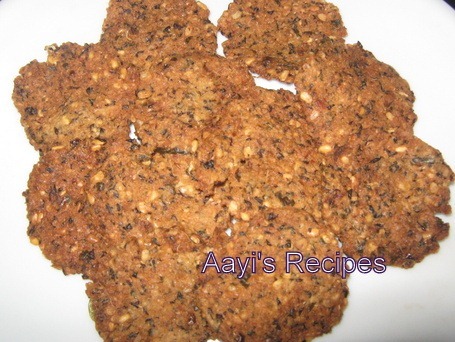 By any chance would you know how to make urid vada , the flat vada with urad flour.. I have a lot of urad flour, want to try somthg other than chakkuli. cookie scoop is a great idea. 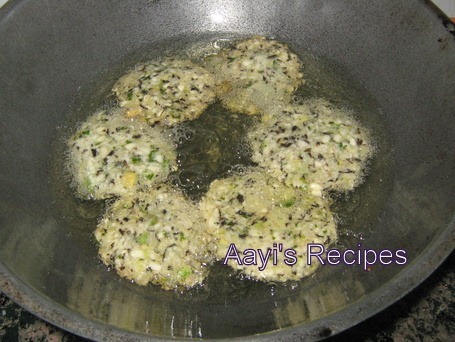 Hi Shilpa, I have been following your recipes since the begining. Every recipe I tried comes out awesome! Thanks. I have been eying on this recipe for a long time and never got a chance to try. But last week I tried and came out great. All my guests loved it.